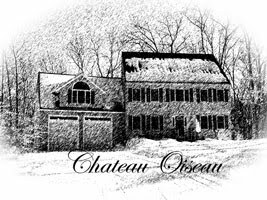 Chateau Oiseau: 2014 Marquette Harvest! Every year that I have been growing grapes has brought something different. In 2012, I had the summer hail from hell which destroyed much of my crop. Later that summer, I lost most of what remained to evil grape sucking yellow jackets. In 2013, I switched to insect netting (instead of plain bird netting) in an attempt to exclude both birds and yellow jackets. But the nets, with finer weave, do not tangle the birds up as much. As a result, they are not afraid of it. They persistently attacked the nets until they got in at the ends, and devoured at least half the crop. I got a crop, but it was only 80 pounds from 30 vines. (Admittedly, many were immature vines. I was expecting about 150 pounds). This year there was no messing around! I stapled the nets at the end of the rows right to the posts of the trellis. Taking the nets off took a little longer but no birds got in. No yellow jackets ate my grapes either. :-) Happy Jacques. But all was not perfect this year! There is always something. This year started with a fairly mild winter, but spring was late. In fact, my Marquette vines budded more than a week later than usual, and flowering was over a week later than usual. Veraison was more than a week late too! On top of that, it was a cool summer. Last year I harvested in the first week of Sept and the grapes were over-ripe. This year when I checked the brix at that same time of the month, they were barely 16 brix! So much for global warming. So I put the word out to my friends via facebook that I was harvesting that day with last minute notice. A few people even showed up to help! (Thanks Suzanne, Chris, Mia and Peter!) We pulled off the nets and started cutting the fruit off the vines. I have to admit, after 6 years of relentless work tending the vines, it was really cool to finally have a good harvest, and a few friends here to join in the fun! From the two blocks we harvested, I got 200 pounds of fruit! Hey, that's enough to warrant getting out the crusher/destemmer! So we crushed it all, and it nicely filled a single large "Brute" fermenter. I added the requisite dose of meta and a dash of enzymes (need to extract those tannins!) and waited 12 hours for the moment of truth: a solid analysis of the brix and pH. And the result? 23 brix at a pH of 3.3. A couple more days to get the brix up to 24 and the pH up to 3.4 would have been perfect, but honestly, I'm not complaining. These numbers aren't bad at all. I decided to make absolutely no adjustments to anything. It's close enough! I am fermenting with plain old BDX. I love that yeast--wonderful flavor. I tried 71B last year for its malic acid-eating performance, but I just don't think it's a great yeast other than that. I ordered some VP41 MLB which will take care of that malic acid just fine! So 200 pounds should give me about 12 gallons, more than enough for my 8 gallon barrel. The real question is, how do I handle the piddly 30 pounds or so that will come off the last block next week? Pulling the nets and time for harvest! 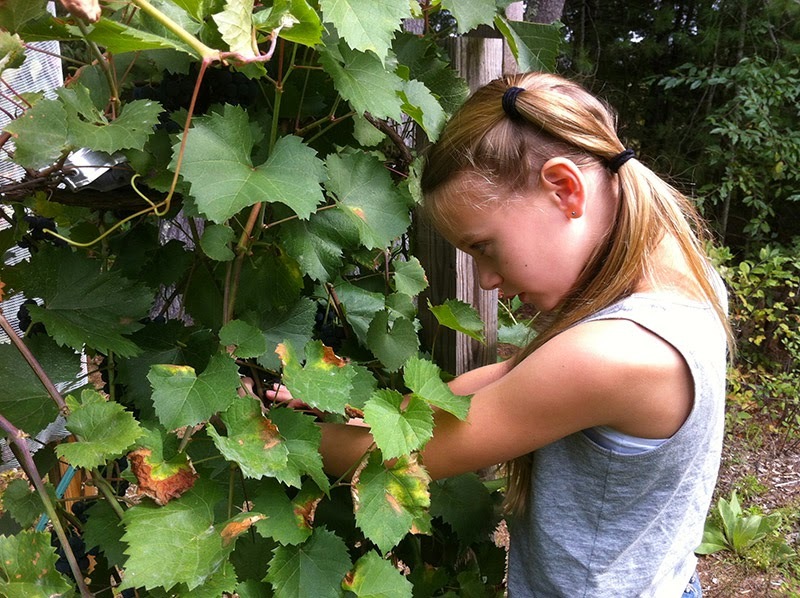 My daughter joins the harvest! 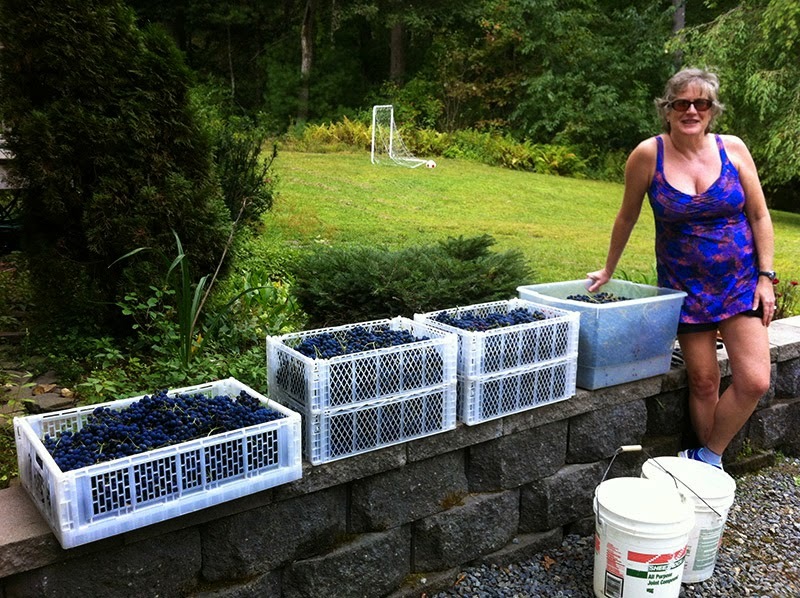 My friend Suzanne Nobile poses by some of the harvest. 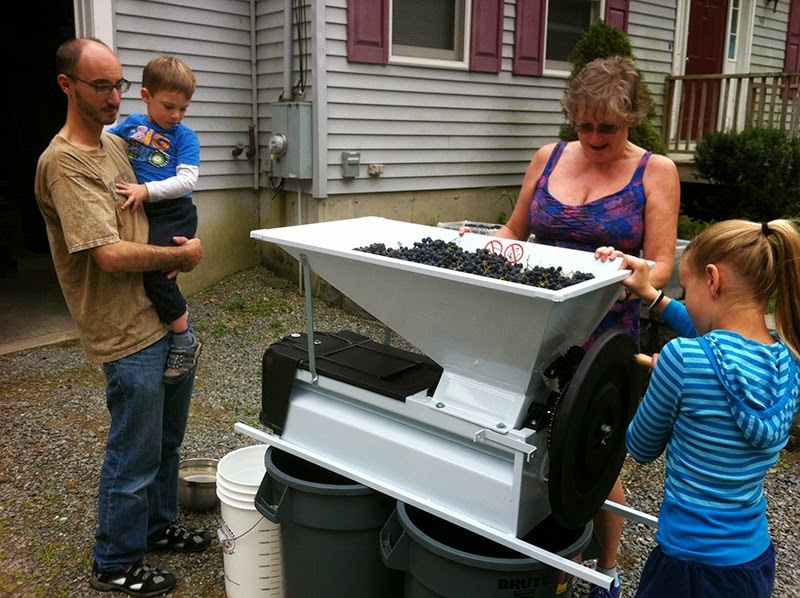 Elise turns the crank and the grapes get crushed! Neighbor Peter Brayton looks on. Finally, a decent harvest. Congratulations Jacques! I admire you for your perseverance. Hopefully you will continue to get great harvests going forward.